This month’s WCA Weimaraner Magazine arrived yesterday with some exciting news on the cover. Olive’s half-brother GCH Doc N’ Camelot’s Heaven Can Wait AKA “Nash” is a “Best in Futurity, Best in Maturity and now all breed Best in Show Winner. 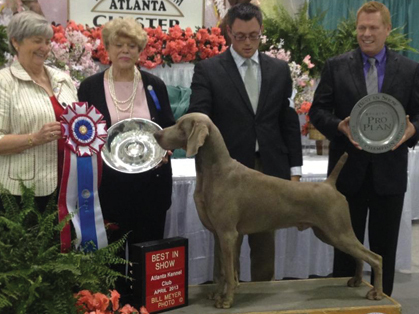 Nash is currently the #1 Weimaraner, all systems.” Nash and Olive share the same sire (father), GCH Camelot’s Knockin’ On Heaven’s Door. Olive would like to wish Nash a very hearty Congratulations!